Gimp. Ubuntu. 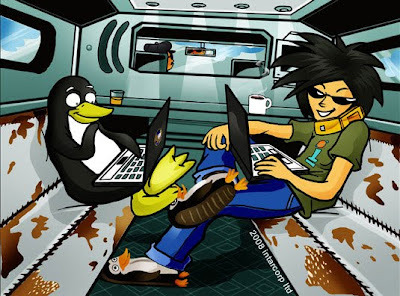 Linux. Distro. Gui. If this sounds like some alien language to you, then you are probably an adult weened on Microsoft and Apple (me, too, so don't think I am pointing fingers here). But the world of Open Source computing is growing fast and if you were to survey a typical high school, my guess is that you would find more than a few budding hackers who know these terms. They could also quickly teach you a thing or two about the value of the Open Source concept of developers across the world working collaboratively to create free computing software and operating systems. And so, along comes a comic called HACKETT AND BANKWELL: SWITCHING TO UBUNTU that can help explain the world of Linux to us and to our students (the ones who did not raise their hands in the previous survey of a typical high school). In the first of two comics (available for purchase as a hard copy or as a free ebook from the website – see below), the two main characters – Woody Hackett and Jerome Bankwell – are taking part in a movie documentary and they convince the producers that using the free Linux system for the production computers is more effective and less expensive. Hackett may be familiar to some as the cute penguin icon of the Linux movement. Here, he guides the reader through the basic ins and outs of Linux, including installation. While the story itself gets a bit too jargony, there are doses of light humor tossed in and, as a guide to a complex topic, the comic format here seems like a natural fit. My guess is that any high school student with a bit of an interest in computers could get hooked with this series and learn a thing or two. (The second book, HACKETT AND BANKWELL: INTO THE COMMAND LINE, goes a little deeper into the technology). The art is effective, if not overwhelming. Hackett is cute but not cuddly, and the way he talks seems a bit at odds with a penguin (not that I am suggesting that penguins are not intelligent but still ... ). Bankwell comes across as a cool kid, with sunglasses and a sort of techno-geek chic that is all the rage these days. When we think about reading and writing across the curriculum, this graphic guide could find its home in the computer lab of most high schools. In fact, compared to some user guides, this comic is downright friendly. Reading through the book made me wonder what would happen if we asked our students to create an expository comic about a complex idea and then share that with a younger audience or an audience unfamiliar with the topics. From a writing perspective, this would force a new way of approaching text with real value. (Maybe a student could create a graphic comic guide for their parents on how to use Facebook or Twitter or whatever technology emerges from the floor up). It should be noted that the distribution of these two books for free (as ebooks) is a wonderful idea that exhibits the concepts of Open Source, as you could easily have a whole classroom of students reading the books right at their computers in seconds. The two books are available as free ebooks or can be ordered as paper copies (with bulk educator discounts also available) at the Hackett and Bankwell site. These books have a technical vocabulary that would make it difficult for most middle school students to understand (maybe even some adults), so I would say that this book is recommended for a high school and university audience. Due to its singular focus, I would say the books are of interest to a general audience wanting to learn more about Linux, but that its real value is as a tool for the classroom. There is nothing inappropriate in these books in terms of language and violence.